The interplanetary despot Thanos (Josh Brolin) finally enacts his plan to take the six mysterious ‘infinity stones’ by force, thus giving him the power to kill half of the universe with just the click of his fingers. Two of the stones are on Earth, meaning that the Avengers, the Guardians of the Galaxy, and every super-powered individual on the planet must band together to save the day. It is difficult to exaggerate the achievement inherent in Infinity War, regardless of its quality. Marvel Studios kicked up an ambitious plan for a shared universe back in Iron Man and The Incredible Hulk (both 2008), and film by film have expanded and elaborated with each successive sequel and spin-off. We are now 19 installments in, and plot threads deliberately laid out for close to a decade all culminate in this one massively expensive, epic-length finale. The Marvel Cinematic Universe obviously continues after this, but for now Infinity War is the climax to everything else that has happened. That we are finally here at film #19, with such an enormous narrative and emotional pay-off, is something I honestly don’t think has been seen in movie theatres before. Of course in television it happens all the time, and that gives Infinity War one of its two most appropriate bases of comparison: it is, in effect, the world’s most expensive and over-loaded season finale ever. The other basis for comparison is the superhero comic event series. Periodically Marvel Comics will bring all of their characters together into one big extended comic series. You don’t get to see any individual superhero too much, but you usually see a hell of a lot of them together. The directors Joe and Anthony Russo applied this technique to their Captain America sequel Civil War, which had too many characters to form a particularly neat narrative but which succeeded tremendously by simply chaining together a string of well-produced and entertaining action sequences that not only thrilled viewers but reflected character. One could consider that film a test run for this, because Infinity War juggles an even larger and unwieldy cast of characters. The difference here is that they are working with a far more carefully planned and effective narrative. This film is, quite simply, incredible. Think about it: everybody who watches Marvel movies has their favourite character. It might be Captain America, or Iron Man, or the Hulk, or Rocket Raccoon, or Shuri from Black Panther. It does not matter which character it is – if they are in the film (and, admittedly, a few aren’t) they get at least a key scene and make a contribution to the plot. Remember we are talking about more than 20 separate characters here, and the film is miraculously only 149 minutes long – and a breakneck 149 minutes at that. The film also finds room to properly introduce Thanos, who has appeared briefly in both The Avengers (2012) and Guardians of the Galaxy (2014) but only really gets to make a proper impact here. For one thing he is a masterpiece of motion capture: he has a weight and a subtlety that makes him feel like a real and powerful character. For another he is brilliantly performed by Josh Brolin, who pulls out remarkable nuance and depth. Finally he actually has three dimensions in his writing and direction. He feels genuinely believable and even weirdly sympathetic as the film develops. It is good to see Marvel delivering such good work with their villains; it used to be the company’s most glaring weak spot. If you have somehow avoided the MCU for the last 18 films, then much of this film – arguably all of it – is going to be an incomprehensible case of ‘inside baseball’. For the millions that have been enjoying these films over the past decade, it is almost the best climax imaginable and then some. You don’t need me to tell you to go see it; you have probably made plans already. Marvel and Walt Disney Pictures have been remarkably insistent with critics and journalists – even general audiences – not to spoil the events of Infinity War. I have respected that request in this review, spare this final paragraph, and I’m spoiling the last bit because I think it is important. Infinity War is not a self-contained film. It ends catastrophically for the heroes, and concludes in a direct cliffhanger to lead into Avengers 4 in 2019. This was not announced; in fact it was actively denied by Marvel Studios who removed next year’s title from Infinity War Part II to something completely different because they were worried it would give audiences the wrong impression. It would: it would let the audience know that when they go to see Infinity War this week they are not seeing a whole story. Now I am sure many fans won’t mind: it’s a genuinely great cliffhanger, and the best ‘all hope lost’ climax to a franchise feature since The Empire Strikes Back. Most viewers were going to come back for another Avengers film regardless. It is also arguable that the climax of Infinity War carries more weight precisely because the audience does not see the ending coming. If you’re taking in a family of kids, however, fronting up in excess of $100 on tickets, parking, snacks, what-have-you, only to find you’re not getting a complete story? There’s a fairly healthy piece of disrespect going on there, and in Disney and Marvel demanding critics and journalists keep that part a secret on the company’s behalf there’s a another little bit of disrespect there too. So I’m choosing not to respect their request. 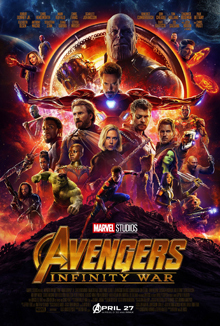 Caveat emptor: Infinity War is great, but it’s a great half-movie. I completely disagree and felt it was totally utterly clear that there were two halves to this film and knew it wasn’t going to be finished here. I’m not sure if Disney or the Russos actually gave interviews saying this was the whole thing but I definitely didn’t have that impression. I don’t know about you, but I’d define what happens as a little more than “a little cross-pollination”. I’m happy to lay money on the new title being Avengers: Secret War, btw.